Fossil fuel shipping has emerged as a major public concern in the Pacific Northwest in recent years. The energy industry is extracting remaining deposits of oil and coal in the interior of the continent, and shipping it via rail and pipeline to port terminals and refineries along the West Coast, to send to the global market. Pacific Northwest residents already have a relatively high environmental consciousness, and growing numbers are questioning the fossil fuel shipments as a detriment to the global climate and local economies and cultures. In some ways, the coastal region is serving as a chokepoint, or a “Thin Green Line,” for energy corporations that are seeking to expand the use of fossil fuels in the midst of the climate crisis. The fossil fuel shipping debate revolves around three major energy resources. Coal has declined in use in the U.S., due to the effects of particulate-laden dust on respiratory health, and its contribution to climate change. Bitumen is a tar-like form of oil that is difficult to extract, and sinks to the bottom of the sea if it spilled. Shale oil is extracted mainly through the technique of hydraulic fracturing (or “fracking”) of the bedrock. Shipping either form of oil from West Coast ports increases the risks of oil tanker spills. The fossil fuel companies are increasingly reliant on energy exports to Asia, particularly to China, to maintain their profits. 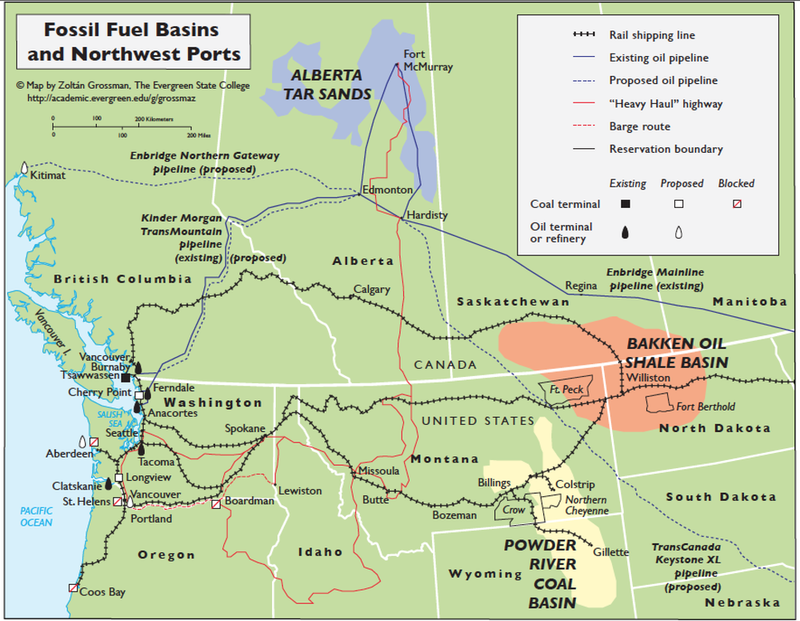 The fossil fuel shipping debate originates in three major fossil fuel basins. The Powder River Coal Basin of Montana and Wyoming has been the source of most coal burned in the Pacific Northwest, but the declining U.S. coal industry is now seeking markets in Asia. The Bakken Oil Shale Basin is where fracking has made North Dakota the #2 ranking state in U.S. oil production. The Alberta Tar Sands is currently the world’s largest industrial development, and its vast bitumen strip-mines in the boreal forest can be seen from Earth orbit. The extraction of these fossil fuels has created negative environmental effects, and to calls for post-extraction clean-up. But the fast-growing local economies have also created negative effects on rural cultures in both Native and non-Native communities, including social effects in the boomtowns (such as increased crime) and the “boom-and-bust” economic cycles of unstable resource extraction. Much of the opposition to fossil fuel shipping has centered on coal trains, which spread coal dust along the rail routes from the Powder River Basin, and create noise and traffic concerns for local residents and businesses. Opposition has also been posed to increasing number of oil trains from the Bakken Basin, some of which have been involved in massive explosions, such as the 2013 fireball that killed 47 people in Quebec. Shipping either the coal or oil by ship or barge in the Salish Sea creates the risk of leaks or spills, which would have devastating effects of the fishing and tourism industries. Much of the bitumen from the Alberta Tar Sands is shipped through British Columbia via the Kinder Morgan pipeline, which is slated for expansion. The expansion of the Keystone XL pipeline from Alberta through the Great Plains was cancelled after strong opposition from ranchers, tribes, and environmental and climate groups. In addition to shipping the oil out, energy companies are also engaged in a “Heavy Haul” of equipment megaloads to Alberta. The fossil fuel debate resonates locally around existing and proposed port terminals and refineries along the Pacific Northwest coast. The proposed Cherry Point / Ferndale terminals, north of Bellingham WA, are receiving Alberta bitumen and Bakken oil, and the defeated Cherry Point terminal would have received Powder River Basin coal. The nearby Anacortes oil refineries use Alberta oil from the Kinder Morgan pipeline, as does the Burnaby Terminal in B.C.. A new Bakken oil terminal is proposed at the Port of Grays Harbor in Hoquiam WA. A new oil terminal has also been proposed in Longview WA along the Columbia River, and a new oil terminal at the Port of Vancouver WA would be the largest on the West Coast. Citizen opposition has already defeated several coal and oil terminals in Washington and Oregon. A wide spectrum of Pacific Northwest residents have become involved in the fossil fuel shipping debate. The most obvious group are environmentalists, who question both the local effects of shipping on ecosystems, but also the global climate effects of burning the fossil fuels. Health workers, including first responders, are concerned about the effects of coal dust and oil pollution, as well as their ability to respond to an oil train explosion. Commercial and sport fishers are concerned about the future of the fishing industry, whether salmon or shellfish, from oil and coal spills and climate change. Low-income communities are concentrated along the rail lines, but have little voice in determining shipping risks. Labor unions have divided opinions, with some backing or opposing coal terminals, but many longshoremen, rail engineers, and firefighters questioning the safety of oil trains. Tribal and local governments have been at odds over many issues, but have cooperated in protecting themselves from coal and oil trains. Women are particularly affected by pollution and the influx of workers to “man camps” in oil and coal boomtowns. Tribes in the U.S. and First Nations in Canada are on the frontlines of fossil fuel extraction and shipping at every step. In the Powder River Basin, the Northern Cheyenne have generally opposed coal development, and the Crow tribal government has generally supported it. At the Washington end of the coal rail route, the Lummi successfully opposed the Cherry Point coal terminal as a threat to their treaty fishing rights, and a desecration of the ancient burial ground. In the Bakken Basin, the Fort Berthold tribal government has supported fracking, even as many tribal members question its effect on their water supply and social stability. At the Washington end of the Bakken oil train route, the Quinault view a planned Bakken oil terminal as a threat to their safety, and their fishing and shellfish cultures. In the Alberta Tar Sands, numerous Cree communities have seen their hunting and fishing cultures devastated, and at the Washington end of the pipeline and rail lines, the Swinomish tribe has led opposition to oil shipping through its reservation. We hope our class website project contributes to the knowledge and debate around these local issues of global consequence. We created this site in hopes that it will be a tool for the public to get an overview of the topics, and to get informed about fossil fuel issues. The references noted on each page are intended to assist public research. The opinions expressed on this website are those of the students and/or their research sources, not of other students or faculty in the program, or of The Evergreen State College. Students: Conner Adamson, Chris Allison, Jess Altmayer, Jesse Ambrose, Yvette Aponte, Lucas Ayenew, Keziah Black, Nathan Boatright, Chelle Bonham, Deann Boyd, Tiffany Brown, Roma Castellanos, Molly Celler, Suzie Chambers, Jennifer Diaz, Rhys Dovey, David Duenas, Colin Edwards, Ellie Engel, Estreya Enquist, Katie Fong, Kelsey Foster, Anne Giles, Emily Hall, Alexandria Marie Johnson, Mary K. Johnson, Ashley Kelly, Kris Kimmel, Jennifer Kosharek, Luca Lezzi, Kyle Linden, Esmael Lopez, Madison Lyon, Emily Martin, Lili Martinez, Alison McGourty, Max Mills, Megan Moore, Aaron Oman, Garret Peck, Amber Powell, Haleigh Ryneski, Antonio Smith, Sierra Sonza, Patrick Stormberg, Vanlyn Turner-Ramsay, Bianca Valles, Elise Vasey, Tanner Williams, and Amelia Withrow. Special thanks to Mary K. Johnson and Amber Powell for their dedicated work on this website.